As I awoke today to a recently absent sun (I did get up before sunrise, but all indications were it was coming), I was thrilled to see the blue near-cloudless sky. It made it easy to believe the weatherman was succumbing to the pressure of those in DFW not familiar with multiple back-to-back cloudy days. His forecast seemed to be anticipating the reality that would be my day–SUN!! I fired up the school “bus” and dropped the girls off to school. Even though the temperature was still in the 30’s the blue skies and the emerging sun seemed to add at least 10 degrees to the temperature. As the sun continued his ascension, I needed to run a mid-morning errand. It was hard not to wear a smile and bask in the gift of the temperature-rising orb that finally accepted our daily invitation to visit. My final errand was going to Sprout’s for a couple of bulk items and vegetables. As I was preparing to check out, the register operator seemed less than enthusiastic to be there. She had a stud on her upper lip, and her whole body hinted (actually, it screamed), “I am not a morning person.” We maintained a simple dialogue. “Your total is $12.76.”, she said as she continued to replay the mental script all good cashiers are trained on. “The card is swiped. Not enough to sign for. Looks like I am all set.”, I continued with a slightly upbeat tone. I didn’t want my tone to be too glaringly cheerful and hurt her apparently overwhelmed head. “I will. You enjoy yours, too.”, I replied as I anticipated seeing the sun and feeling the sunlight again in a few moments. Maybe I am too old to be so cheered by the sun. And, maybe I just need to do the self-checkout so I don’t force anyone to engage in dialogue with a “happy” person. If the purpose of some of my errands is to pull a small smile from a slightly bored employee, I am okay with that. And, if I encounter a cashier who is a morning person, then the “good feelings” from the conversation can be banked for the next time I find someone who is not a morning person….sometimes I am not one either. The closest highway to our house is due south. It is “820”. It is an outerbelt to Fort Worth. Just to the east to southeast of us are a couple of more well-traveled highways. And, to the west, there is US 35. (US 35 is a slightly messed up highway. It “splits” north of DFW and reunites south of DFW north of Waco. This allows directions containing “Go north on 35W off of 820W”) The story I heard is when “the really smart highway engineers” realized all of these highways were generating more traffic than could reasonably be handled by the existing structure, somebody came up with a rather unique plan. Since we have quite a few toll roads in Texas-even though some of them are lightly used, “the really smart cheapskates who make decisions on how to pay for highways” decided they would allow someone (enter a rich guy from the Middle East-remember, I am not researching this-it is what I was told) to pay for the construction of this new road. Fortunately, due to the incredible volume of traffic, “the people in Austin who have a conscience” would not allow the road to become a toll road with no alternatives. They chose to split the difference. They created a “normal” chunk of 820 (speed limit 60 mph), and they created a chunk of 820 (and points slightly east) where there is a toll with a speed limit of 70 mph. (Having a toll card makes the pain minimal.) “The people who sucked in an investor to this unique project” did give him/her (“the person/company who needed to spend lots of money on a project where they may never get a return on their money”) a concession. Not only did “the greedy investor” get a toll road, but they got a road with varying tolls. I have seen the tolls as low as $0.25 and as high as $3.25. It varies on time of day and how thick the traffic is at that particular moment. My adventure occurred yesterday morning. It was a thick foggy day with visibility of less than 1/2 a mile. After dropping off the girls at school, I began the normal 7:30ish route home. Due to the visibility or the novelty of fog or the arrogance of some over-zealous Texas driver, my normal, non-toll route was WAY backed up. I detoured to the access road (This is also a phenomenon in Texas. I was not aware of “access roads” in Ohio. Essentially, it is a road that runs parallel to many of the highways. It allows a driver to get on the highway from the access road without having to enter an entrance ramp from a complete stop. It also allows many addresses to incorporate the names of the highways. An address like, “8200 820E” might be a completely valid address.) to avoid sitting in traffic for any extended time. 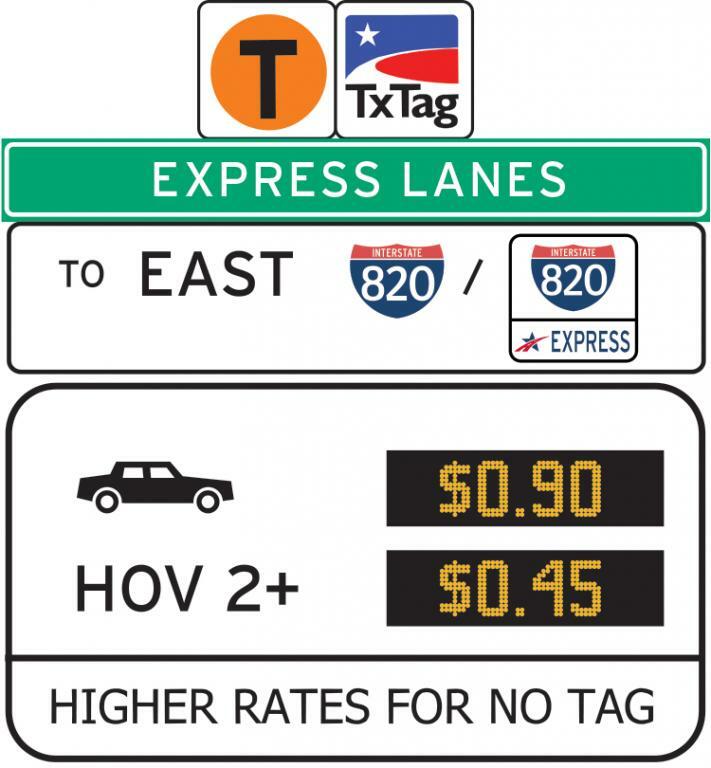 At the next intersection, I could make a turn to the left or right OR I could go straight before choosing to take the left or right fork – one to the “normal” 820 and one to the “toll” 820. Unfortunately, I chose left. (I should have known left was the toll because on the highway the toll road is situated inside of the normal road.) I endured a near traffic free journey to the next exit. (This exit was past my normal exit. The “express” did not allow me to get off where I wanted, but it was close…) The rest of my journey home was uneventful. As I dropped off the girls today, there was minimum fog and light traffic on the normal route home. When I drove by the sign where my toll would have been displayed yesterday, the same “detour” today would have cost me $1.40. I have convinced myself I would have sat in traffic for a considerable amount of time if I did not take my “joy ride”, so it is obviously money well spent! The cold weekend had made most of the trees decide the leaves were optional attire. Many of the oaks were still maintaining some modesty. As winter progressed they would also shed their old clothing in anticipation of the new clothes awaiting them in the spring. And, it was these old clothes covering many of the sidewalks that gave my wife and I much pleasure. One of the earliest dates I can remember was a walk through my wife’s neighborhood. It was just after a brief rain. Because I was still more boy than man (I likely still fit that description in most categories), I found humor in grabbing the trees lower branches and shaking them as we passed under the low hanging limbs. Granted, I may have gotten a little wet as well, but my future wife did take the brunt of the trees premature shedding of the accumulated rain. Today’s walking date had leaves that were not going to be holding any rain for young lovers to shake onto each other’s heads. The leaves were mostly all spread out on the sidewalk. They were content to sit idly by awaiting any slight breeze. Or, they were content to lay their all snug with their kindred who had enjoyed a season together enjoying the blue Texas sky. As we walked through the older congregants of St Oak, the leaves swished together to remind us they were there. In our wake, they whispered their concerns until the motion of our footsteps was a memory. As we walked through more seasoned piles of leaves, we enjoyed the special earthy smell reserved for dampened leaves. Some of the leaves decided to rustle together, appearing to have slightly more disagreement about the their present roles. If they were to far gone to rustle or less trusting of the pedestrians determined to disrupt their retirement, the leaves may have yielded an occasional crunch as a secret stash of acorns was revealed. As we neared the end of the walking route, we knew it was not the leaves or the breeze or the mistletoe (Yes, we are not too old to notice) growing in many of the trees that took us out on this post-dinner walk. It was time to enjoy each others company without having to share each other with those we had left at home to clean up the dishes. It was time to realize and remember the commitments made and the life shared. And, it was time to burn a few of the extra carbs eaten during dinner…. Both my wife and I were working from home today. Her day is usually filled with meetings, but sometimes, as in today, she gets an hour or so gap. Today, she had a 1 1/2 hour gap between meetings, so we knew we could take on virtually anything our construction-laden walk might throw at us. Our confusion with a solar powered sign announcing “Expect Delays” over the past week led to our downfall…..
Our normal (this is normal since about 3 -4 weeks ago) walk takes us on the new paths completed by our city, through a couple of neighborhood, beside a couple of softball fields as we wind through a park, along a well-shaded train track and down a non-sidewalked road with fairly low traffic. We were aware the beginning part of our path might have an obstacle, so we were not surprised when within the first 10 minutes we had to backtrack. As we navigated some unfamiliar streets to get to the main road, we chose to go toward a possible rendezvous point with our “normal walk” at a point south of the construction zone. Me: You certainly do appreciate sidewalks when you don’t have them. Wife: I knew there was no sidewalks here. The traffic is much louder off of the main road. Wife: You are not frivolous. You are the most serious walker I know. After enduring the noise and near conversation vacuum, we made a right to pick up our “normal trail”. We cursed our luck as we could nearly see the northern point of the path closure. (Throwing gravel at the southern point seemed juvenile. It was only this fact that prevented me from acting on my whim.) As we rejoined our path, we checked our time. We both felt confident my wife could still make her conference call. Due to familiarity, our legs went into auto-pilot. Our conversation was sparse but consistent until we came to the point where we left the railroad tracks behind and headed north. I suppose we were grateful the “Road Closed” sign and related paraphernalia was visible from the tracks. However, the “returning home in time for the conference call” issue was now seriously in question. My wife chose to continue west rather than bungying back home. Knowing we needed to push ourselves, I became the pace mule. Conversation was more scant than before as we seldom walked side by side. I continued to try and maintain a good pace whether we were within talking-range or a few yards apart. As the sidewalk ended and we began heading north again, we rapidly passed businesses and woods while sidewalk were available, but mostly optional. (The recently expired fox was a slight distraction.) Eventually, we were able to go briefly east and catch a side road that also went north. The sidewalk were consistent and we were close enough together to comment on some of the “over the top” Christmas light displays. As we neared a “branch” that would allow us to reattach to our “normal path”, the clock became an even bigger enemy. My wife cut all corners possible. The neighborhood did not allow for much “corner-cutting”. She saved all of the cutting for the park. She hopped guard rails and ignored barriers that would have previously limited our path on normal days. (We had to go cross country at the park because of another construction zone. Our desired path was right on the other side of equipment and a large pile of broken concrete, dirt, and recently sacrificed flora.) As we rounded a corner and came upon the playground area, a young couple who were walking their dog parted after apparently having their innocent kiss now classifed as “PDA” due to our appearaance. As we again were able to place our feet on our elusive “normal” path, we noted how my wife would be about 10 minutes late for her meeting. Her 10 minute delay was not wasted. All of our winding and pushing and navigating resulted in a walk totaling 5 – 6 miles. It was not the first time we had taken a walk of this length. Fortunately, it was a rather cool day, or the walking disaster would also have been a dehydration nightmare! After my youngest son graduated from high school in the spring, he had a great summer of semi-transitioning into adulthood. He worked many hours at Chick-Fil-A, and he was a responsible social creature. He did stay up too late more nights than not, but he did seem to be on a declining video game schedule. When he started at college in the fall (really not even late summer), he seemed to find his college stride. He only visited home a couple of times. He complained about the food in the cafeteria almost every chance he could. He had a couple of missteps with his assignments and with the colleges curfew policy, but despite his frustration, he worked to resolve the problems in a mature way with only enough pain to remind him not to do it the next time. He got involved in extracurricular activities which limited his opportunity to make bad decisions. In summary, he spared us the challenge of helping him solve problems from 3 1/2 hours away. Unfortunately, while he was home for Thanksgiving, I realized there was still quite a bit of boy in there. Two days before he was coming home, he called me asking if I would transfer money from his saving to his checking account. He wanted to pull money out of an ATM to buy someone’s lightly used Nintendo DS (newest model I think). Since he had been good this quarter, I agreed. After he got home, he seemed to spend a good bit of his time with his computer. He was playing RuneScape. (He did do other social things, but I rapidly was becoming convinced he was not letting the influence of the other students in the honor dorm break him of all of his habits.) Lastly, him and his brother went out and did some “Black Thanksgiving” shopping Thursday night. He did buy some Christmas gifts for others, but he also purchased himself a new game. And, he went to GameStop on Black Friday and bought even more stuff. As I look back, I can’t help but believe this bit of regression is rather normal. After taking almost exclusive responsibility for himself AND his laundry for a few months, it is so easy to fall into your old behaviors. Although we would likely still recognize his more mature self, it is comforting to see him regress just a little bit. And, as much as I would like to see the mature young man who calls us about once a week from school, all regressing is acceptable….as long as the report card confirms he is as mature as we think! Once you live in a neighborhood long enough, the “For Sale” signs are bound to go up. The person across the street sold over a year ago. And, this weekend we have another neighbor moving out. We are jockeying for parking space in front of our house while trying to discourage parking in front of our mailbox until after the little white truck w/ the nice Jamaican postal worker deposits our letters and catalogs. Linewoman: Haven’t we met you before? Me: If you are going to be our new neighbors on Cattle Prod (not its real name) street, we have! Linewoman: We are excited to move into the neighborhood! We like the location, and it was just time to get a larger house! (the line started to move again) We can talk more inside. This morning, the neighbor who is moving out dropped by and dropped off the key we let him have just “in case”. Our conversation went something like this….. Neighbor: Well, today is the day. 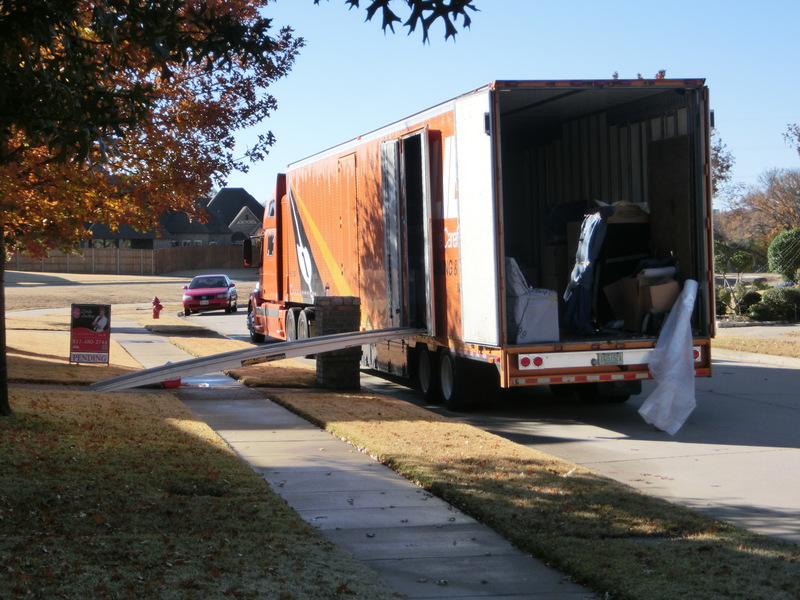 I hope the trucks don’t get in your way, but tonight will be our last night in the house. I hope we have been a good neighbor! Me: You sure have! We have had issues with the neighbor on the other side and the one across the street before they moved out. You have been nothing but a help whether it was the pool pump or any other issue. I thank you for that! Have you met the person who is moving in? Neighbor: My wife has. She thought it was a mother and a couple of kids. She thought they seemed nice. Me: One Sunday afternoon, I met them. I thought the mother had a husband. I guess we will find out soon. Neighbor: Yes, the close date has been pushed back. We have sold to the relocation company, but I think the house will sit empty a week or so before they move in. Me: Better go supervise their packing. If things are going into storage before you find a house, you don’t want any problems when you open the cartons in Connecticut. (He told me the headhunter was so surprised someone would want to leave Texas and move to New England.) You have been a good neighbor, and I thank you for it! Best of luck to you and your wife! Neighbor: Thanks, Andy! Have a great Christmas. As our best neighbor leaves, we are very hopeful the new neighbor does not disappoint the expectations developed through the interviewing process. As little influence as we had on the final decision of who would move in next door, we are truly hopeful the minimum expectations are met. We have had enough car dings and bipolar mood swings out of our neighbors. Just give us a family (any of the definitions of family apply even if somewhere on the LGBT spectrum) with a couple of kids (preferable one within a couple of years of my daughters) who have minimum distinguishing features (this includes tattoos, piercings, and/or clothes or hair styles) but with a desire to try and be a good neighbor, and we will be fine. As I was entertaining a toddler today with hand gestures at Panera while his mother and grandmother were chatting , I got an chance to strike up a conversation with his grandmother. Even though the conversation with “Granny” was brief while mom was in the bathroom changing juniors diaper, we found out we had quite a few things in common. Granny: I have 3. Two in Florida and one here with one more on the way. We had two kids of our own..
Me: We have 4 kids. Two of each. Fourteen months between the boys and 16 months between the girls. (Her daughter who was in the bathroom was pregnant with #2-18 months between her kids.) Right now, we also have 2 exchange kids. Granny: When the kids were younger, we had 7 exchange students. Four from Germany; 1 from Switzerland; 1 from Finland, and 1 from Chile. Granny: We adopted a sibling group of 3. The oldest two moved out when they turned 18. The youngest is still at the house. When he turns 18 in two years, he is probably going to leave too. I told him I would get him back to Pennsylvania, and then I guess I will be done with him like I am with his brother and sister. Me. : When you told me before, you said you only had 2 kids…. Granny: Yes, I know. They just never felt the same. I adopted them at 11, 10, & 8. They just never felt the same. Jenny (who is now done with changing diapers has joined us) was 23 when we adopted them. I kept our adopted daughter from getting pregnant, and I kept our adopted son out of prison. I had higher goals, but those are the only things I really think I accomplished with them. (she pauses) When the last one leaves, we will be done. Me: Wow, well God bless you for doing that! I know it must have been hard! My wife and I had a sibling group of 3 for awhile. We didn’t adopt them, but the family that did, watched them leave their families as soon as they graduated from high school. They packed up their things and moved to Florida with their older siblings. I hope it is something you are glad you did even though it wasn’t what you hoped for. I felt sorry for the mother and daughter. I am sorry their family didn’t get the support and counseling they needed. (okay, it is hard to know everything in a brief conversation. ) And, of course, I feel sorry for the kids who were adopted and either never felt loved OR would never let themselves be loved. Also, I feel very grateful my family never went forward with any adoptions. We could have, but chose not to jump so far into the unknown. However, I am slightly jealous in a way. With all of the blessings my family has, it would seem like we have a responsibility to share them in a larger way then we presently do. Maybe the “idea” for doing sharing our blessings is just a conversation and a Panera visit away….